14K Gold Men's Wedding Band - 14kt yellow gold 6.0mm wide comfort fit wedding band. The ring is satin finished. Different finishes are available. 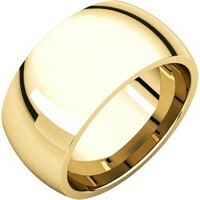 Yellow Gold Men's Wedding Band - 18kt yellow gold 6.0mm wide comfort fit wedding band. The ring is satin finished. Different finishes are available. 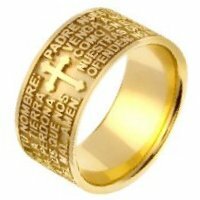 Padre Nuestro Wedding Band - 14K gold Padre Nuestro (Lord's Prayer) wedding band. The wedding band is comfort fit. Padre Nuestro Wedding Band - 18K gold Padre Nuestro (Lord's Prayer) wedding band. The wedding band is comfort fit. 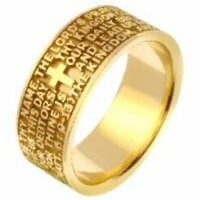 Lord's Prayer Wedding Band - 14K yellow gold Lord's Prayer wedding band. The wedding band is comfort fit. 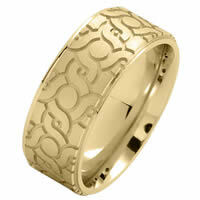 Lord's Prayer Wedding Band - 18K yellow gold Lord's Prayer wedding band. The wedding band is comfort fit. 14Kt Yellow Gold Patterned Diamond Wedding Ring - 14kt yellow gold, 4.0 mm wide, patterned diamond, comfort fit wedding ring. There are 6 round brilliant cut diamonds set around the whole ring. The diamonds are about 0.06 ct tw, VS1-2 in clarity and G-H in color. The ring is 4.0 mm wide. 18Kt Yellow Gold Patterned Diamond Wedding Ring - 18kt yellow gold, 4.0 mm wide, patterned diamond, comfort fit wedding ring. There are 6 round brilliant cut diamonds set around the whole ring. The diamonds are about 0.06 ct tw, VS1-2 in clarity and G-H in color. The ring is 4.0 mm wide. 14K Yellow Gold Patterned Diamond Wedding Ring - 14kt yellow gold, 8.0 mm wide, patterned diamond, comfort fit wedding ring. There are 6 round brilliant cut diamonds set around the whole ring. The diamonds are about 0.06 ct tw, VS1-2 in clarity and G-H in color. The ring is 8.0 mm wide. 18K Yellow Gold Patterned Diamond Wedding Ring - 18kt yellow gold, 8.0 mm wide, patterned diamond, comfort fit wedding ring. There are 6 round brilliant cut diamonds set around the whole ring. The diamonds are about 0.06 ct tw, VS1-2 in clarity and G-H in color. The ring is 8.0 mm wide. 14Kt Yellow Gold Carved Wedding Ring - 14kt yellow gold, 8.0 mm wide, carved, comfort fit wedding ring. The ring has a mix of hammered brush finish and polished finish. The ring is 8.0 mm wide. 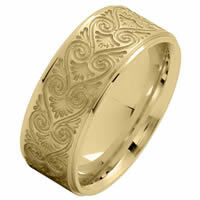 18Kt Yellow Gold Carved Wedding Ring - 18kt yellow gold, 8.0 mm wide, carved, comfort fit wedding ring. The ring has a mix of hammered brush finish and polished finish. The ring is 8.0 mm wide. 14Kt Yellow Gold Carved Square Ring - 14kt yellow gold, carved, square, comfort fit ring. There is a carved design on each corner of the ring with a sandblast finish. Other finishes may be selected or specified. The ring is 7.0 mm wide. 18Kt Yellow Gold Carved Square Ring - 18kt yellow gold, carved, square, comfort fit ring. There is a carved design on each corner of the ring with a sandblast finish. Other finishes may be selected or specified. The ring is 7.0 mm wide. 18 Kt Yellow Gold & Blue Enamel Ring - 18 kt yellow gold and blue enamel ring. 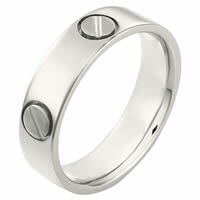 The band is 11.0 mm wide and comfort fit. 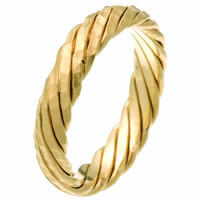 There are two handmade twisted ropes in the band made with 18 kt yellow gold. 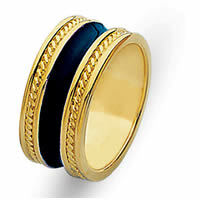 The center of the ring has blue enamel. The whole ring is polished. Different finishes may be selected or specified. 14 kt Gold Wedding Band - 14 kt yellow Gold hand made comfort fit Wedding Band 6.0 mm wide. The ring has fasteners that resembles screws. These are around the whole ring. The ring has a matte finish. Different finishes may be selected or specified. 14K Yellow Diamond Wedding Band - 14K yellow gold, flexible, 8.0 mm wide, comfort fit, 0.48 ct tw diamond. Diamonds are graded as VS in clarity G-H in color. The finish in the center of the ring is brushed and the outer edges are polished. Different finishes may be selected or specified. 14 Kt Yellow Gold Square Ring - 14 kt yellow gold square comfort fit 7.5 mm wide wedding band. The ring has 3 square shaped rings welded together to create a beautiful contemporary style. It is a polished finish and 7.5 mm wide. Different finishes may be selected or specified. 18 Kt Yellow Gold Square Ring - 18 kt yellow gold square comfort fit 7.5 mm wide wedding band. The ring has 3 square shaped rings welded together to create a beautiful contemporary style. It is a polished finish and 7.5 mm wide. Different finishes may be selected or specified. Diamond Wedding Band. - 18 Two-Tone, 7.5 mm wide diamond wedding ring. Diamond total weight is 0.30 ct. VS1 in clarity G in color. The center of the ring is brushed and the outer edges are polished. Different finishes may be selected or specified. 14 kt Gold Wedding Band - 14 kt White Gold hand made comfort fit Wedding Band 6.0 mm wide. The ring has fasteners that resembles screws. These are around the whole ring. The ring has a matte finish. Different finishes may be selected or specified. 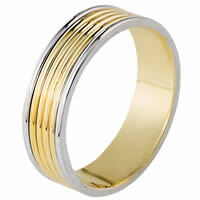 18K Two-Tone Gold Wedding Band - 18 kt two-tone, 5.5 mm wide, comfort fit wedding band. The whole ring is polished. Different finishes may be selected or specified. 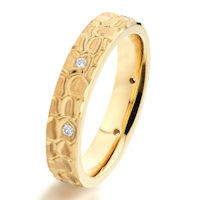 18K Yellow Diamond Wedding Band - 18K yellow gold, flexible, 8.0 mm wide, comfort fit, 0.48 ct tw diamond. Diamonds are graded as VS in clarity G-H in color. The finish in the center of the ring is brushed and the outer edges are polished. Different finishes may be selected or specified. 14K Gold Wedding Band. 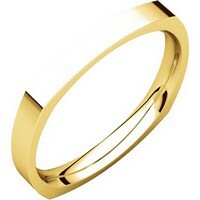 - 14 Kt gold wedding band, 4.0 mm wide, comfort fit wedding band. The band is plain with subtle accents. The finish on the ring is polished. Different finishes may be selected or specified. 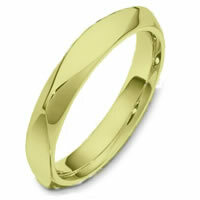 Twisted Wedding Ring - 14 kt yellow gold 5.0 mm wide comfort fit wedding band. The ring is a contemporary style twist and matte finish throughout the whole band. It is 5.0 mm wide and comfort fit. Different finishes may be selected or specified. 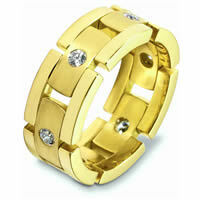 Center Rotating Gold Wedding Band - 14kt Gold Center Rotating Hand Made 5.0 mm Wide Comfort fit Spinning Wedding Band. The center rotating portion has a matte finish and the edges are polished. Different finishes may be selected or specified. 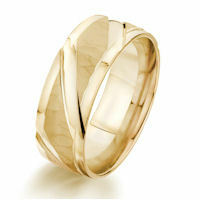 Square Comfort Fit Men's Wide Wedding Ring - 14kt Yellow gold square, comfort fit, 4.0mm wide wedding band. The ring has a square shape and has a brushed finish. Different finishes may be selected. 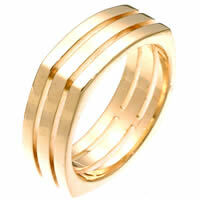 Center Rotating Gold Wedding Ring - 18 kt Gold Center Rotating Hand Made 5.0 mm Wide Comfort Fit Spinning Wedding Band. The center rotating portion has a matte finish and the edges are polished. Different finishes may be selected or specified. 18K Gold Wedding Band - 18 Kt gold wedding band, 4.0 mm wide, comfort fit wedding band. The band is plain with subtle accents. The finish on the ring is polished. Different finishes may be selected or specified. 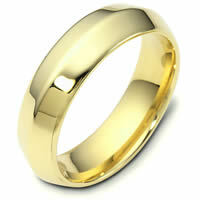 18 kt Gold Wedding Ring - 18 kt yellow Gold hand made comfort fit Wedding Band 6.0 mm wide. The ring has fasteners that resembles screws. These are around the whole ring. The ring has a matte finish. Different finishes may be selected or specified. 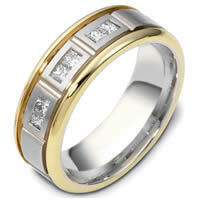 18 kt Gold Wedding Ring - 18 kt White Gold hand made comfort fit Wedding Band 6.0 mm wide. The ring has fasteners that resembles screws. These are around the whole ring. The ring has a matte finish. Different finishes may be selected or specified. 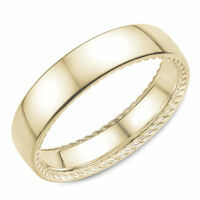 Twisted Wedding Ring - 18 kt yellow gold 5.0 mm wide comfort fit wedding band. The ring is a contemporary style twist and matte finish throughout the whole band. It is 5.0 mm wide and comfort fit. Different finishes may be selected or specified. 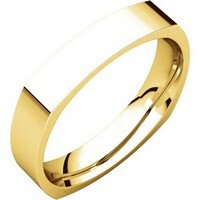 Contemporary Two-Tone Wedding Band - 14kt Two-tone gold contemporary, comfort fit, 4.0mm wide wedding band. The whole ring has a polished finish. Different finishes may be selected or specified. 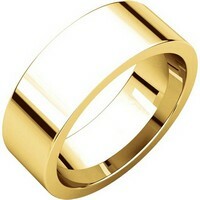 Contemporary Two-Tone Wedding Band - 18kt Two-tone gold contemporary, comfort fit, 4.0mm wide wedding band. The whole ring has a polished finish. Different finishes may be selected or specified. Modern Yellow Gold Wedding Band - 14kt Yellow gold modern contemporary, comfort fit, 6.0mm wide wedding band. The ring has a polished finish. Different finishes may be selected or specified. Modern Yellow Gold Wedding Band - 18kt Yellow gold modern contemporary, comfort fit, 6.0mm wide wedding band. The ring has a polished finish. Different finishes may be selected or specified. 14K Designer Wedding Band - 14K two-tone gold 7.0mm wide, comfort fit, black antique wedding band. 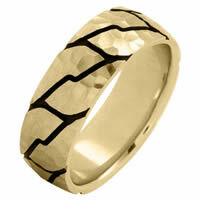 18K Designer Wedding Band - 18K two-tone gold 7.0mm wide, comfort fit, black antique wedding band. Square Classic Wedding Ring - 14kt Yellow gold square, classic, comfort fit, 2.5mm wide wedding band. The ring is square shaped and the corners are slightly thicker than the center portion of the band. The ring is matte finish. Different finishes may be selected. 14 Kt Yellow Gold 9.5 MM Carved Wedding Ring - 14 Kt Yellow gold, comfort fit, 9.5 mm wide, carved wedding ring. The ring has a carved pattern in the center that is brushed finish. Outer edges are polished. Other finishes may be selected or specified. 18 Kt Yellow Gold 9.5 MM Carved Wedding Ring - 18 Kt Yellow gold, comfort fit, 9.5 mm wide, carved wedding ring. 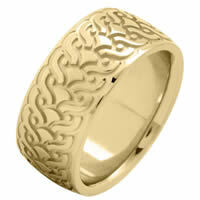 The ring has a carved pattern in the center that is brushed finish. Outer edges are polished. Other finishes may be selected or specified. 14 Kt Yellow Gold 8.5 MM Carved Wedding Ring - 14 Kt Yellow gold, comfort fit, 8.5 mm wide, carved wedding ring. The ring has a carved pattern in the center that is brush finish. Outer edges are polished. Other finishes may be selected or specified. 18 Kt Yellow Gold 8.5 MM Carved Wedding Ring - 18 Kt Yellow gold, comfort fit, 8.5 mm wide carved wedding ring. The ring has a carved pattern in the center that is brush finish. Outer edges are polished. Other finishes may be selected or specified. 14K Heavy Comfort Fit Wedding Band - 14K gold heavy comfort fit plain 10.0mm wide wedding band. Different finishes are available. 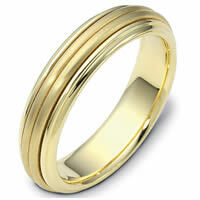 18K Heavy Comfort Fit Plain Wedding Band - 18K gold 10.0mm wide, heavy comfort fit wedding band. Different finishes are available. 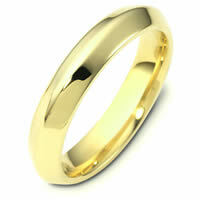 14K Yellow Gold Wedding Band - 14K gold, plain, 7.0 mm wide, flat, comfort fit wedding band. The ring is completely polished. Different finishes may be selected or specified. 14 Kt Yellow Gold 8.0 MM Carved Wedding Ring - 14 Kt Yellow gold, comfort fit, 8.0 mm wide, carved wedding band. The center of the ring has a carved pattern and brush finish. The outer edges are polished. Other finishes may be selected or specified. 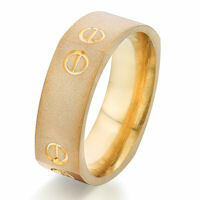 18 Kt Yellow Gold 8.0 MM Carved Wedding Ring - 18 Kt Yellow gold, comfort fit, 8.0 mm wide, carved wedding band. The center of the ring has a carved pattern and brush finish. The outer edges are polished. Other finishes may be selected or specified. 14 Kt Yellow Gold 8.0 MM Carved Wedding Ring - 14 Kt Yellow gold, comfort fit, 8.0 mm wide, carved wedding ring. The ring has a carved pattern with black antique and a hammered pattern. The ring is brushed finish. Other finishes may be selected or specified. 18 Kt Yellow Gold 8.0 MM Carved Wedding Ring - 18 Kt Yellow gold, comfort fit, 8.0 mm wide, carved wedding ring. The ring has a carved pattern with black antique and a hammered pattern. The ring is brushed finish. Other finishes may be selected or specified. 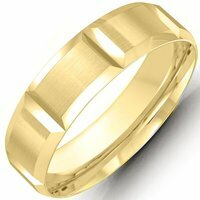 Yellow Gold 9.0 MM Carved Wedding Ring - 14 Kt Yellow gold, comfort fit, 9.0 mm wide, carved wedding ring. 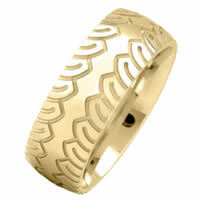 The ring has a carved pattern in the center that is brushed finish. Outer edges are polished. Other finishes may be selected or specified. 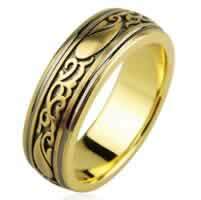 18 Kt Yellow Gold 9.0 MM Carved Wedding Ring - 18 Kt Yellow gold, comfort fit, 9.0 mm wide, carved wedding ring. 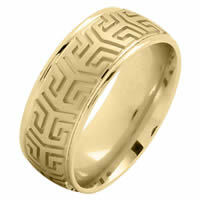 The ring has a carved pattern in the center that is brushed finish. Outer edges are polished. Other finishes may be selected or specified.